Free Easter Sermon Outlines is an outline of an Easter Sermon. One way to learn how to write an easter sermon outline is to check out how other people write their sermon outlines. Free Easter Sermon Outlines is an Easter sermon outline from Colossians 1:20-23 which looks at the Easter message of reconciliation. The defining point of the Easter message is reconciliation. We know that Easter is about Jesus’ death and resurrection, but why did Jesus died...why did Jesus rise from the grave? The apostle Peter summed it by saying, “Christ died once for sins, the just for the unjust, that He [that is, Jesus] might bring us to God” (1 Peter 3:18). The Easter message is about reconciliation - humanity being reconciled with God. Look at verse 20, “And by Him to reconcile all things to Himself, by Him, whether things on Earth or things in heaven, having made peace through the blood of the cross” (Colossians 1:20). 1. Why Do We Need To Be Reconciled With God? There are two reasons why we need to be reconciled to God! A. We are separated from God. Look at the beginning of verse 21, “And you (referring to the Colossians), who once were alienated from God." At one stage in their lives, the Colossians were separated from the life of God. They were literally cut off from God and His love. We all have been in that position. Before I heard the message about Jesus, I was separated from God. I was dead in my trespasses and sins. I was totally lost. I was separated from God and His love. I was in that dreadful position until someone shared the message of Jesus with me. The Easter message is a message of reconciliation. The sad thing about it is that many people have never really heard the Christian message of Easter. In fact, statistics tell us that around 50% of people do not know what Easter is all about. They have never stopped and looked or even examined the message of Easter. Separation leads to sin and sin makes us an enemy of God. In other words, when we are separated from God, the very things we do are offensive to God. When we are separated from God, the very things we do are hostile toward God. As the apostle Paul said, “Because the carnal mind (unsaved mind) is enmity (hostility) against God” (Romans 8:7). In our unsaved state, our attitudes and actions only frustrate God. 2. How Can We Be Reconciled To God? A. Sin requires death for its payment. The Bible says, “the wages of sin is death” (Romans 6:23). Before Adam sinned, there was no death. Man lived in harmony with God. After Adam sinned, “death spread to all men” (Romans 5:12). Jesus was the only one who could pay the payment for sin. The Bible says, “Jesus bore our sins in His own body on the cross” (1 Peter 2:24). Why did Jesus die? So that we could be reconciled to God! It was by his wounds that you have been healed. B. Sin requires the shedding of blood for forgiveness. The Bible says, "Without the shedding of blood, there is no remission of sin" (Hebrews 9:22) If there is no forgiveness, then there is no reconciliation. The Easter message tells us the way of reconciliation. Jesus died for our sins, was buried and rose on the third day to bring us new life...to bring us to God. 3. 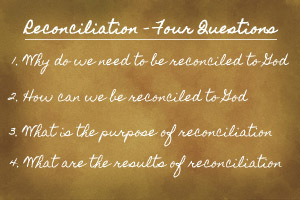 What is the Ultimate Purpose of Reconciliation? We know that God has delivered us from the penalty of sin—past reality. We know that God has delivered us from the power of sin—present reality. But one day God will deliver us from the presence of sin. That’s the ultimate purpose of reconciliation. 4. 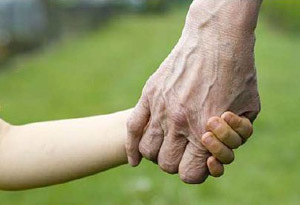 What are the Results of Reconciliation? There are threes results in this passage of Scripture. An abiding faith is the hallmark of true reconciliation. When we are reconciled to God, we have an unmovable hope. We know that we are saved...we know that we belong to God...we know that we will be with God in heaven when our time on earth is up. C. A message for all! We have a message of reconciliation. The defining point of the Easter message is reconciliation. It’s about mankind being reconciled to God. Free Easter Sermons: Free Easter Sermons provide Easter sermons and explain how to write an Easter sermon. Free Easter Sermons: Free Easter Sermons provide an outline of an Easter sermon and free downloads of Easter sermons.